It was a historic season for girls soccer, beating SAHS and SFS for the first time in school history. 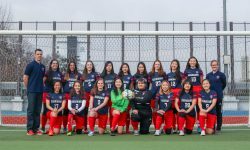 The girls finished the KAIAC season 12-2-1 and overall 12-7-2. They finished up Co-Champions in the KAIAC regular season and 2nd in tournament play. The team traveled to Malaysia (Dalat) in October for the first ACSC Tournament. They finished 5th in the tournament. During the ACSC tournament the girls had the opportunity to go to a homeless facility and help the organization with baking, clothes sorting, and cleaning.